A specialist in surface and underground mining geology, Ant has over 20 years experience in Australia, Papua New Guinea, and New Zealand. In 2000, Anthony set up a team to respond to the growing demands of the expanding hydro and export coal mining industries in New Zealand. That team is Geotech. Sven is a professional Engineer with senior experience in quality control for highway construction, foundation preparation and construction of engineered landforms. Sven has nine years experience in highway and infrastructure design in both the UK and New Zealand. He is an experienced project manager, road designer and cost estimator. Financial Controller - David Currie, B Comm. David has over 30 years of business experience in commercial and public accounting, information and communication technologies, and sales and marketing. This experience comes from his involvement in a range of enterprises including the mining sector in Western Australia, the de-regulated data and telecommunications industry in NZ, and over the last decade, his accounting and business advisory firm Pounamu Accounting. Gary is a hugely experienced and competent technician and Project Manager. He is a specialist underground and surface shotfirer, and a highly competent rockbolter and shotcreter. 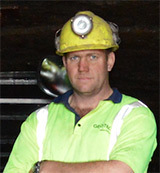 Gary has worked for Geotech since 2007, and has had a key role in all our mining and tunnelling operations. He is incredibly hard-working, client-focussed, and has extensive experience in the supervision of staff in safe work practises. 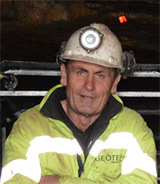 Clive has worked for Geotech since 2010, and is one of our most skilled operators and supervisors. Clive is experienced in above ground and underground operations, and has a vast list of industry certifications. 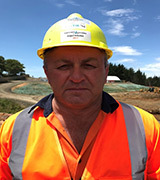 Clive has extensive experience in heavy machinery operation in difficult terrain, and has supervised a wide range of work, including projects at Stockton Mine, Amethyst Hydro tunnel and the Kaikoura earthquake remediation works. 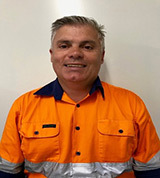 Louis is a qualified diesel mechanic, and was originally employed by Geotech in 2014 as our maintenance manager, responsible for the management of our extensive heavy diesel fleet based at Strongman Mine. He is now Project Manager, assisting with oversight of a number of key projects. As well as being an exceptionally skilled mechanic, Louis is a capable supervisor and site manager, with a strong focus on health and safety, professional standards and productivity. 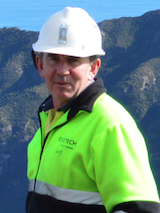 Tony has 35 years experience in civil contracting and mining. 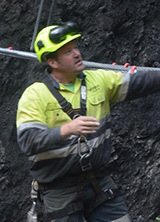 Tony has extensive mining experience and has supervised or managed a number of large (up to 65 staff) extractive sites over the past 15 years. He has a strong focus on health and safety and looking after his staff. Tony brings his formal qualifications, extensive practical experience and knowledge to all projects. Tony is conscientious and task driven- able to work under pressure and to meet deadlines. He is a very capable team leader; focussed on increasing productivity and efficiency in the work place without compromising positive work relationships. Jimmy is a new member of the Geotech team. He is an experienced geologist with 30 years’ worth of experience within some of the most structurally complex geological basins (gold, coal, platinum) in the world across Africa, Australia and New Zealand. 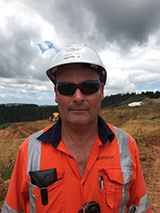 He has a National Diploma: Geology and a PG Diploma: Mineral Resource Management and is currently deployed to the Auckland Operations as part of the Geotech Ltd expansion strategy.